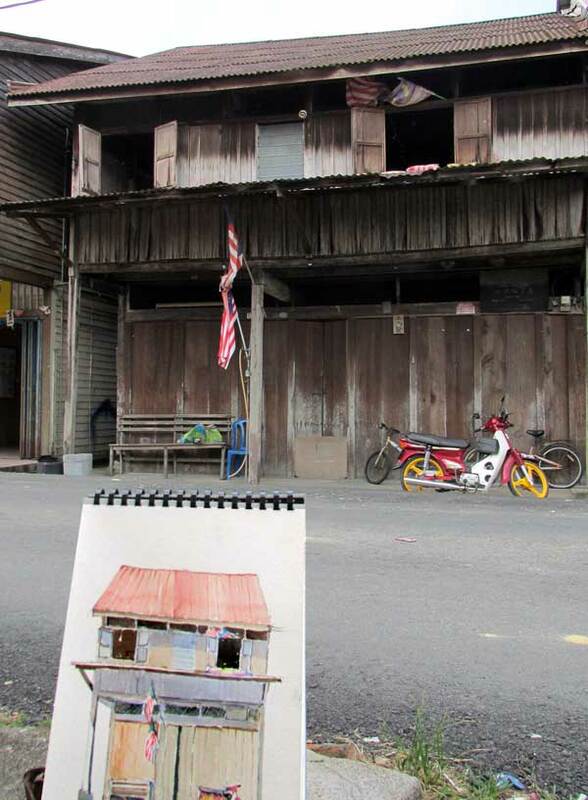 A CLUSTER OF traditional wooden houses on stilts in Pulau Duyung, Kuala Terengganu, is drawing a steady stream of visitors, mostly foreigners, to its doorsteps despite not being promoted much. 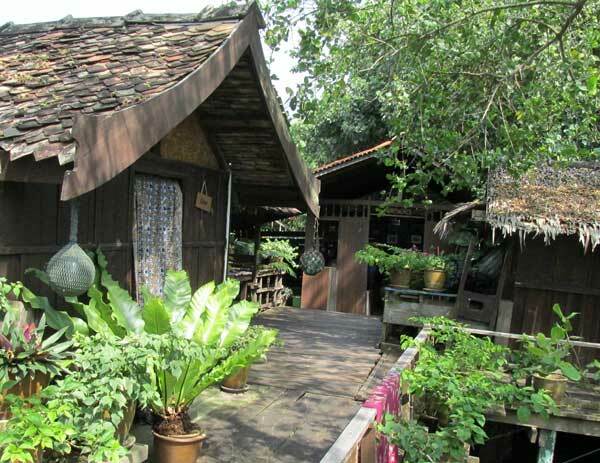 Awi’s Yellow House, as this back-to nature-rough-it-out accommodation is known as, comprises a cluster of 10 chalets of various sizes built by seafarer Wan Osman Wan Abdullah (or Awi as he is fondly known) and his wife Rohani Longuet in the 1970s. According to Rohani, who is in her 70s, it was originally built to house those who came from afar to have their boats built by the local craftsmen. The chalets were added as more people came, both to build their boats as well as to visit the island. 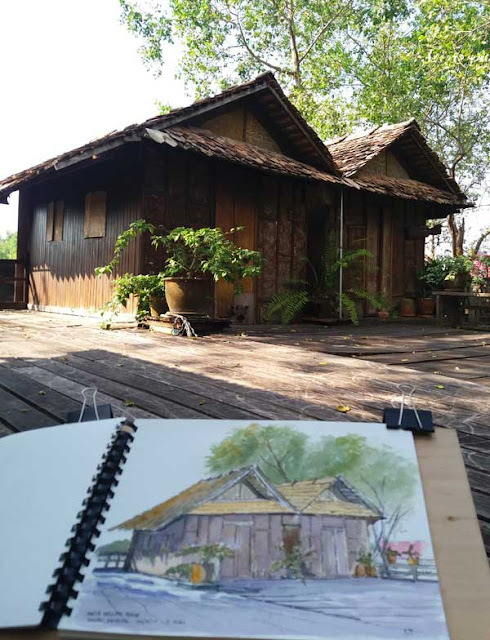 I was there recently for an artist residency programme and fell in love immediately with the Malay kampung-style riverine life. While painting this piece under a huge mangrove tree, known as the berembang, I was transported back to my childhood days when my family lived in Kampung China, Kuala Terengganu. 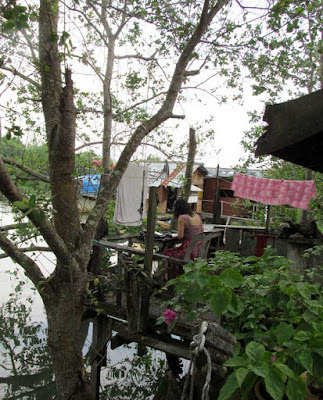 The back of our house was also built on stilts over the Terengganu river and when the tide brought in clear waters, a cool dip would never be missed. Children living on riverine houses were born to swim, we proudly told visitors. Although Awi’s Yellow House is rarely promoted in tourism programmes, it is well known among foreign visitors to Terengganu. Strings of accolades have been showered on it by grateful travellers who have walked through its doors. In recent years, it has also received rave reviews in travel portals such as Lonely Planet and Virtual Tourist. Awi, who is in his 60s, has been often praised for his friendly hospitality. The rooms here are basic and the beds come with mosquito nets. If you have not slept under one, perhaps this is one of the few places you can give it a try. Some of the chalet units have attached bathrooms equipped with basic facilities. There is a common shower and toilet, and a common kitchen area which have the basic utensils if you decide to cook. If not, a walk around the neighbourhood will take you to some stalls where you can have a decent and affordable meal rich in local flavours. There is also a sundry shop at the entrance to Pulau Duyung where you can get your supplies if you need some. The entire chalet area is a huge boardwalk constructed from tropical hardwood. It is built around mangrove trees that rose from the mudflats. When the tide is in, the water’s surface is just a few metres beneath the floorboards. Mullets and small riverine can be seen darting off just below the surface when startled by human presence. I caught a glimpse of a family of otters foraging at the water’s edge during one of the mornings while I was there. The foliage of the towering berembang trees keep the area decently shaded and cool even on the hottest of afternoons. The chalets are built is such a way that there are plenty of natural light for you to curl up with a book or sit and paint the riverine scenery. There is certainly no lack of greenery here, both of decorative flowers in pots around the chalets as well as the indigenous nipah palms and more mangrove flora rising from the banks. AS the Yellow House is strategically located on Pulau Duyung, you can also check out the main attraction that made Duyung famous — the traditional shipbuilders who are famed for huge seafaring vessels based just on the experience imprinted in their minds. There are a few within walking distance of the Yellow House. Call 09-622 2080. Awi will be happy to take your call. Ask why the chalet is named so and he will be more than happy to share interesting stories behind it. 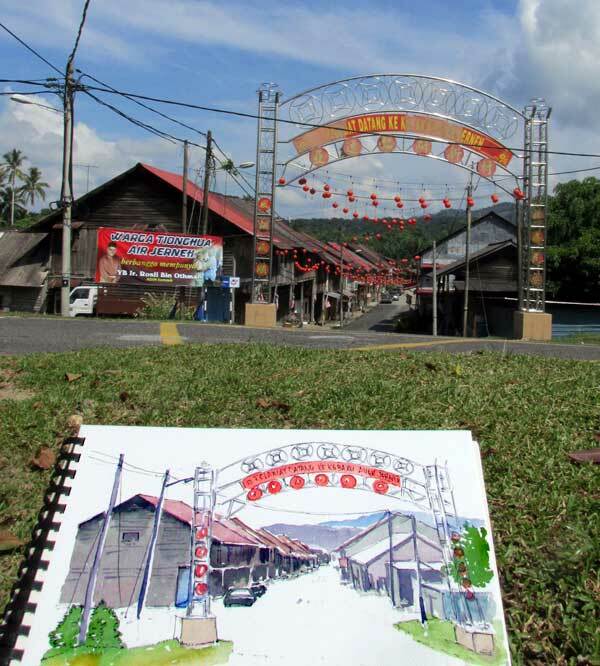 A quick sketch of Kampung Air Jernih's entrance. HIDDEN from the coastal thoroughfare that runs through Kemasik, Terengganu is an old Hainanese village where time seems to have stood still. Said to be at least a century old, Kampung Ayer Jernih was believed to be founded by a group of Hainanese migrants who made their way from Hainan island, China, to Terengganu in the early 1900s. During its heyday in the 1950s, ‘60s and ‘70s, the story has it that there were no less than 1,000 Hainanese families living here, making it possibly the largest Hainanese settlement in the country then. 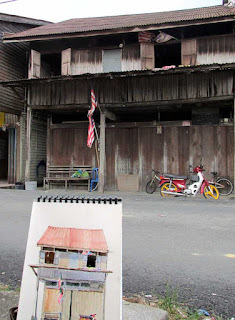 Today, there are only about 400 to 500 families left, according to a village elder I met while doing a painting of one of the old houses opposite the Hainanese Association. A gleaming steel arch carrying the village’s name greets visitors at the entrance, which is on higher ground. A police station and a Chinese primary school flank the single road that runs in a curve round the village. Two rows of quaint doublestorey shophouses, reminiscent of those in ancient China, some say, stand on both sides of the road just wide enough for two small cars to squeeze through. Many of the houses, especially those at the upper end of the road, appeared abandoned and dilapidated. When I was there, on a Friday afternoon, with a long weekend ahead, the street was deserted. The silence was broken by the distant strains of Chinese songs from the ‘60s. The doors of the occupied homes were either half-open or shut. Most of the coffeeshops, including the most popular one named Yeen Her, beside the Hainanese Association, were closed, or about to. A villager later told me that most of the residents had gone down to Kuala Terengganu to join the Mazu Festival, a celebration of the community’s patron saint. The early settlers were farmers who mostly cultivated pepper and other cash crops. 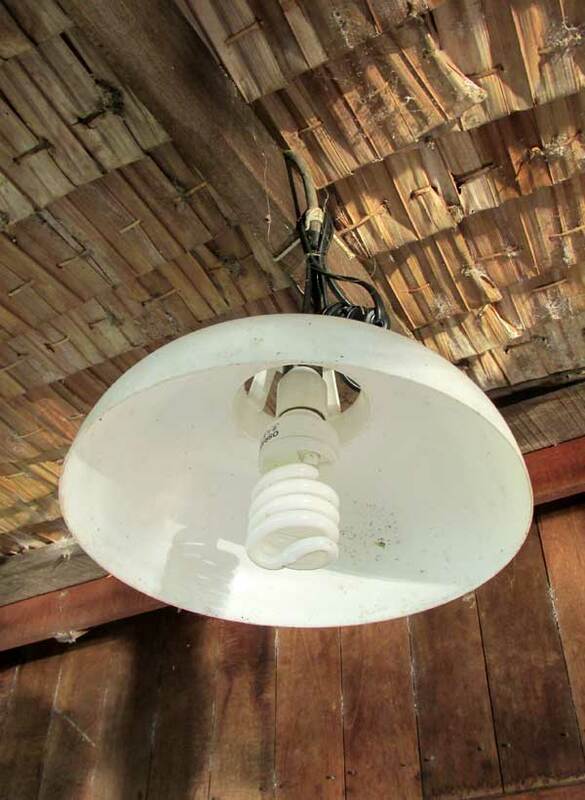 During the 1950s and ‘60s, they turned to rubber and oil palm. Today, rubber appears to be the main income earner as can be seen from several scrap collection centres operating from the old shophouses. Two big ones are located at the back of the town, with sacks of stinking dried latex clumps awaiting transportation. There is also an oil palm fruit collection centre 100 metres away from here. During my trip there last year, while taking a break at the coffeeshop next to the Hainanese Association, I learnt that life in Kampung Ayer Jernih has not changed much over the decades. I remember eating some local cakes, presumably made using recipes passed down over the generations. One was a steamed rice cake that I had not seen elsewhere and another, steamed brown tapioca cake. 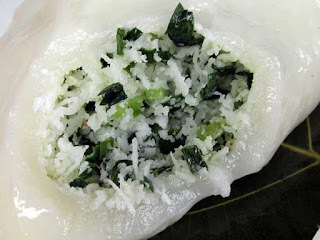 This time, though, I did not get the chance to try these delicacies. I also learnt that the Kampung Ayer Jernih has been identified as another tourism attraction for Terengganu but this being Visit Terengganu Year 2017, I did not sense any signs of the winds of change - save for the lanterns that were hung near the archway. I wonder if they were lighting the way to the village’s new beginning or were merely decoration left over from Chinese New Year. I will return again to enjoy the rustic charm of this quaint village. Kampong Ayer Jernih is 8km from Kemasik town. If you are driving along the East Coast Expressway, exit at Kijal Toll Plaza. From here, Kampung Ayer Jernih is 9km via Jalan Jabor- Penghantar and T13. There are signages showing you the way. Drive slowly as some stretches are uneven and littered with pebbles. If you are driving from Kuala Terengganu in the north via the Jalan Kemaman-Dungun coastal road, locate Mesra Mall just before Kemaman town. Two kilometres south of Mesra Mall, turn right at the junction to T13. The village is 9km from here. Kampung Ayer Jernih, Kemasik, is well-positioned in Waze and GoogleMaps but access to the networks can be a pain, so switch on your GPS while there’s a connection.